There are many many blogs and websites relating to tea and tea making out there but if you want one of the first and best articles I think you have to go back George Orwell's famous "A Nice Cup Of Tea", which can be read here, and was originally published in the Evening Standard in 1946. I'm not going to rehash Orwell here as you should just jolly well click the link and read the piece for yourself. It's very fun reading and basically sound advice if you want to make tea the old fashioned way. Christopher Hitchens attempts (not entirely successfully) to update Orwell's tea making instructions, here, but at least Hitchens admits to the existence of something called a tea bag. The Guardian commenters and tea purists would rather see their sons and daughters run off to join a cult than use a tea bag, but I am comfortable with the tea bag and use it myself much of the time. I agree with Hitchens however that tea bags should NEVER be left in a cup of tea and when I watch the Big Bang Theory etc. I find myself utterly aghast when characters walk around the set with tea bag rat tails dangling down the side of their mugs. The tea is stewing that whole time getting more and more tannic and unpleasant. Get the tea bag out of the mug as quickly as possible is my advice. I make the best cup of tea in our house. My tea is a comforting brew that can be given to sniffly children or confused Jehovahs Witnesses* or people who have just had a road accident. Its not a purists tea. Its milky, often made with a tea bag (although sometimes leaves) and it often contains SUGAR. Yes that's right, I said it. I sometimes put sugar in my tea. Orwell disagrees, the Guardian disagrees, Hitchens disagrees but when the mood strikes I like sugar in my bloody tea. Tea with sugar was the drink that built and lost the British Empire. 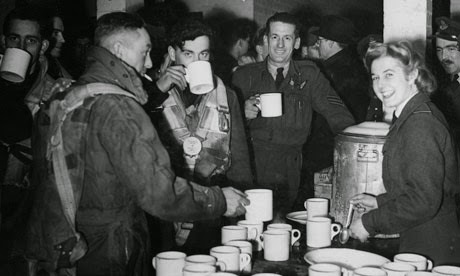 Tea with milk and sugar was the drink they drank while breaking the Enigma code at Bletchley Park, that the pilots drank in the Battle of Britain, etc. Anyway, this is how I make tea. Like I say if you're a purist or some kind of tea nut STOP READING NOW. 2. While kettle is boiling, add milk and either Ceylon Orange Pekoe tea leaves (in a tea infusion ball) or a strong tea bag (Twinings Assam Bold is a good one) to the mug. Let the tea and the milk mingle. No one, and I mean no one, ever does this but I do and I explain why below. 4. Remove the tea bag after about 45 seconds. 5. Add sugar to taste. I prefer one tea spoon.